McCullough Landscape Architecture, Inc. (MLA) a San Diego firm, recently moved into new offices in the renovated 100-year-old Snowflake Bakery Building, in San Diego’s East Village I.D.E.A. (Innovation, Design, Education and Art) District. San Diego’s largest urban neighborhood is rapidly developing the I.D.E.A. District and the hip Makers Quarter, a live/work/play neighborhood near City College. With the addition of not only McCullough Landscape Architecture, but also several buildings under construction and the recently opened San Diego Central Library, this area is seeing a renaissance. Across the street from The Snowflake Bakery Building is the SILO venue of Makers Quarter, a year-round destination bringing collaborative community and creative culture to East Village. McCullough Landscape Architecture is a woman-owned Small Business Enterprise led by CEO Catherine McCullough with David McCullough as the firm’s principal landscape architect. Their markets include retail, hospitality, entertainment, public and institutional clients. Their company has created projects for customers such as Sunbelt Investment Holdings, Starwood Hotels & Resorts, Gary Goddard Entertainment + Design, the cities of Carlsbad and San Diego, the State of California, Viejas and Valley View Casinos and the San Diego Community College District. MLA’s award-winning designs have been featured in major design and trade publications. 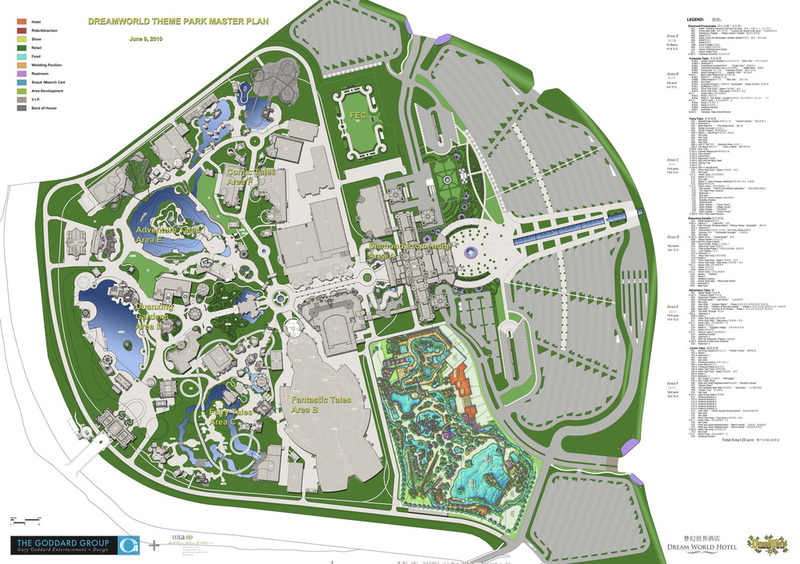 McCullough Landscape Architecture, Inc. (MLA), a landscape design and planning firm located in downtown San Diego, has announced the completion of the design development phase for an amusement park located in the province of Fushun, China. The amusement park, officially titled Fushun Dream World, is approximately 200 acres in size (larger than Disneyland) and is MLA’s largest project to date. The park has an array of features including a high-rise hotel, a high-end shopping area called the “Diamond Promenade”, an indoor water park, an immense family entertainment center, and five theme specific areas. MLA began the design development phase for Fushun Dream World in early 2010. Fushun Dream World is a theme park that has similarities to Disneyland both in its layout and quality. The park itself has a central hub that is accessed after passing through the “Diamond Promenade” and then branches out into the five different themed areas. Additionally, a train system traverses the outer rim of the park with three main stops along its route to allow the park's patrons easy access to all of its areas. Fushun Dream World is just another of a growing list of entertainment and hospitality projects for MLA. Local venues such as the recently renovated Valley View Casino and Hotel, and the Viejas Casino and Retail Outlet Center are among other projects Mr. McCullough lists in his portfolio. MLA regards projects of this type a specialty for their firm and sees a potential for growth in these markets.